Khyra's Canine Rescue Run - auction item - bidding to start at $30.00 - keepsake of this rescue can be shipped worldwide! 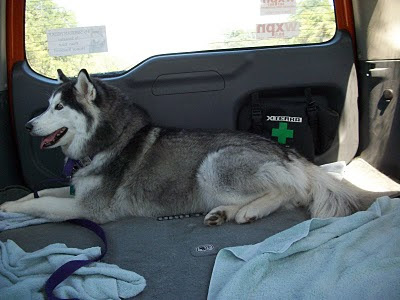 We are delighted to be able to offer you the chance to sponsor one of Khyra and her mom's weekend canine transport runs. Each of these transports are generally around 200 miles so you can appreciate both the time and the love that goes into each one. So many pups benefit from the kindness of Khyra and her mom, with each and every transport carrying rescue dogs towards a brighter future where they have the chance to find the love and security that every dog deserves. Sponsoring one of these transports gives you the opportunity to become part of this rescue process. You will be able to choose which transport run you sponsor which makes this an ideal and wonderfully thoughtful gift for an upcoming birthday or anniversary. 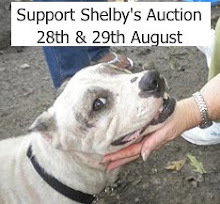 You will be commemorating the joyous moment that many dogs move towards a new life AS WELL as helping sweet Shelby in the process as your sponsorship money will go directly to her vet bill fund. If you are lucky enough to place the winning bid for this auction item Khyra will dedicate the blog post about the rescue transport to you. You will also receive a commemorative certificate and booklet with photographs and details of the dogs that were rescued (including Shelby!) as a special keepsake. ONLY 1 AVAILABLE - BID NOW (STARTING PRICE $30.00) BY LEAVING YOUR NAME AND BID PRICE IN THE 'POST A COMMENT' SECTION BELOW - AND FEEL FREE TO CONTINUE TO BID SO THAT YOU OUTBID YOUR FELLOW CONTESTANTS!! WE WILL CONTACT THE HIGHEST BIDDER WHEN THE AUCTION CLOSES. Furry well pawed JD and Max! I khouldn't have pawed it better and I yapped it myself! We would like to kick off with an opening bid of $40! We'd like to up our bid to $50. Ooh, this is a very exciting bidding 'war'! We KNEW this would be a popular item, it's such a wonderful thing to sponsor - our tails are really wagging! We would like to raise that bid to $75!!!! Pink Daisy, Roscoe and the Kittehs! Who are all resuces! How about $85? We will do it for Shelby. WOW, this is exciting! Khyra & her floofmobile are being auctioned off! How fun!!! We are in it! 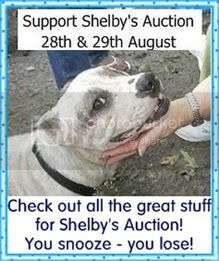 More help for Shelby!